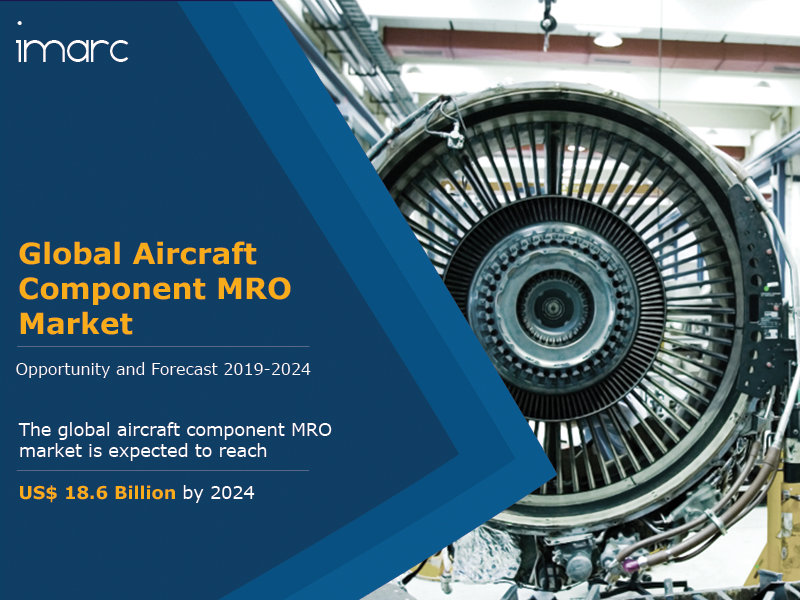 The global aircraft component MRO market was worth US$ 16.2 Billion in 2018. Aircraft component MRO, also known as maintenance, repair and overhaul, is a set of administrative, managerial, and supervision activities. They are employed for restoring aircraft components to their original state of performance and function. MRO in the aeronautical industry has strict and precise requirements stated by the airworthiness authorities to guarantee the safety of cargo, passengers and aircrew. It plays a vital role in maintaining product quality, reliability and availability. The services encompass components including mechanical actuators, avionics and electronics, fuel systems and carburetors, and landing gear and auxiliary power units (APUs). Over the past few years, airline operators and OEMs have been using radio-frequency identification (RFID) in the commercial aerospace component MRO market to enhance the cost-effectiveness of the services provided by them. However, airline companies are now outsourcing these activities to third-party organizations for contract organizations. As aircraft component MRO accounts for a significant portion of airline expenses, this trend has created numerous growth opportunities in the market. In addition to this, improving economic conditions in regions like the Middle East, Asia and Africa has led to the demand for low-cost air travel services. Apart from this, the introduction of innovative software technologies has helped OEMs in fulfilling the airworthiness standards of EASA and FAA. Such software programs offer features like labor-hour tracking, maintenance scheduling, and service bulletins for airline operators and service providers. According to IMARC Group, the market is expected to reach a value of US$ 18.6 Billion by 2024, at a projected CAGR of 2.3% during 2019-2024. The report has also analysed the competitive landscape of the market with some of the key players being Delta TechOps (U.S.), Lufthansa Technik AG (Germany), Air France Industries KLM Engineering & Maintenance (France), HAECO (Japan), Honeywell International (U.S.), ST Aerospace (Singapore), AAR Corp.(U.S.), Barnes Aerospace (U.S.), FL Technics (Lithuania), Turkish Technic, Inc. (Turkey), etc.